MeadowChase Farm is a full service equestrian facility with 50 acres including large beautiful pastures, ponds, and run-in shelters. We have two riding arenas: one sand arena with lights for riding in the evening. Our second arena is equipped with obstacles and challenges to promote Riding In Harmony. 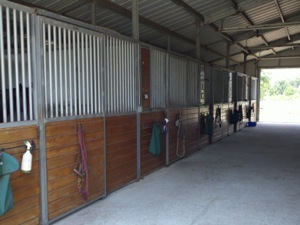 We also have 4 large paddocks for private turn-out and a round pen. There is trail riding on and around the Farm, with plans to add miles of riding paths around the property. We have an additional “outside” obstacle course for those wanting a challenge outside the arena.